The mansion is named after the small church of 1831, located in the property. "Alla Chiesetta", recently renovated, is immersed in a green pearl, in a strategic position: just a few minutes from the tourist attractions and from the center of the Manzoni city, but also from splendid walks in the mountains surrounding Lecco and overlooking the Lake. Each guest will be welcomed on arrival, as well as by our smile even from a cake with ingredients at Km 0. Dwelling to the church has agreed for you some agreements with some shops (confectioners, opticians, clothing, other) and restaurants. - A bedroom with double bed, wardrobe and bedside tables. - A bedroom with a single bed that converts into a double bed, wardrobe and chest of drawers..
- A living room with equipped kitchen, sofa and television. - A full bathroom and a washing machine. - Car garage available exclusively. 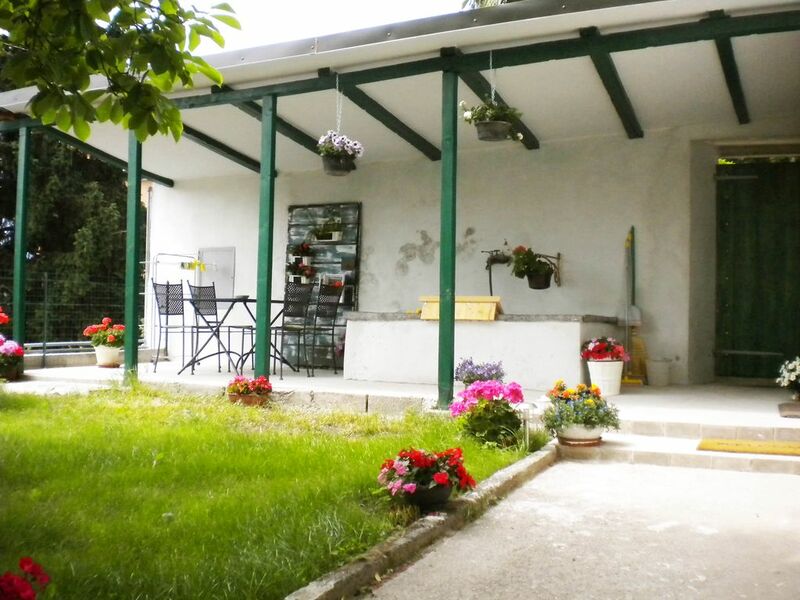 - Small private garden with barbecue and patio with table and chairs where you can have lunch. Sheets, bathroom sets and kitchen linens. STAY TAX: € 1.00 per night per person over 14 for a maximum of 5 days ..
We loved our stay at Angelo's apartment. The apartment was clean, comfortable and with good views over Lecco. The apartment sits on the family's estate, and Angelo et al are gracious hosts. They made us very welcome, and even cooked up some special food for our arrival. After that they gave us space to enjoy our stay with the right amount of privacy. The apartment is up a narrow, quiet street, but there is an accessible garage to park a car. The apartment is a 5 minute walk from a great pasticceria, 10 minutes walk from the supermarket and about a 30 minute walk from the lake and centre of Lecco. Thanks again, we hope to come back! We were cycling the northern lakes/mountains and Lecco is the perfect base to explore. The Bonacino family were very generous, professional and warm hosts, daily gifting us with cakes and organic eggs from their own chickens. This is the best equipped house I have ever stayed in. From the kitchen to the bedrooms to the private garden with our own BBQ everything was thoughtfully provided. We would highly recommend this property and the family. Posizione tranquilla,appartamento molto curato,molto pulito,dotato di tutti i comfort. Ci siamo trovati molto bene, i padroni di casa sono persone eccezionali,fuori dal comune per ospitalità,disponibilità e calore umano. Il giardinetto esterno è molto rilassante,l’appartamento è curato nei dettagli ,funzionale,dotato di tutti gli accessori e anche di più,(materiale informativo sul territorio,opuscoli vari,non manca nulla) . Thank you so much to family Bonacina. Merci encore pour la bouteille de Champagne pour mon anniversaire ! A recommended place for every one. Ein sehr herzlicher Empfang mit selbstgebackenem Kuchen, viele Lebensmittel waren vorhanden und inklusive, sehr sauber, modern eingerichtet, geschmackvoll. Tolle Aussicht auf den Comer See und auf Lecco. Garten mit süßer Sitzecke. Ganz Wundervoll.